Hydroxylbastnäsite-(Nd): Mineral information, data and localities. For the locality at the Bastnäs mines, Riddarhyttan, Skinnskatteberg, Västmanland, Sweden, plus the "Hydroxyl" prefix due to the dominance of the hydroxyl radical over fluorine and the "-(Nd)" suffix due to the dominance of neodymium in the composition. The neodymium analogue of Hydroxylbastnäsite-(Ce) and Hydroxylbastnäsite-(La). Bastnäsite-(Y) 2 photos of Hydroxylbastnäsite-(Nd) associated with Bastnäsite-(Y) on mindat.org. Calcybeborosilite-(Y) 2 photos of Hydroxylbastnäsite-(Nd) associated with Calcybeborosilite-(Y) on mindat.org. Gasparite-(Ce) 1 photo of Hydroxylbastnäsite-(Nd) associated with Gasparite-(Ce) on mindat.org. Chernovite-(Y) 1 photo of Hydroxylbastnäsite-(Nd) associated with Chernovite-(Y) on mindat.org. Christensen, A.N. (1973): Hydrothermal preparation of rare earth hydroxycarbonates. The crystal structure of NdOHCO3. Acta Chemica Scandinavica 27, 2973-2982. Dexpert, H. & Caro, P. (1974): Crystal structure of NdOHCO3. Mater. Res. Bull. 9, 1577-1585 (in French). Maksimović, Z. & Pantó, G. (1985): Hydroxyl-bastnaesite-(Nd), a new mineral from Montenegro, Yugoslavia. Mineralogical Magazine 49, 717-720. Farkas, L., Maksimović, Z. 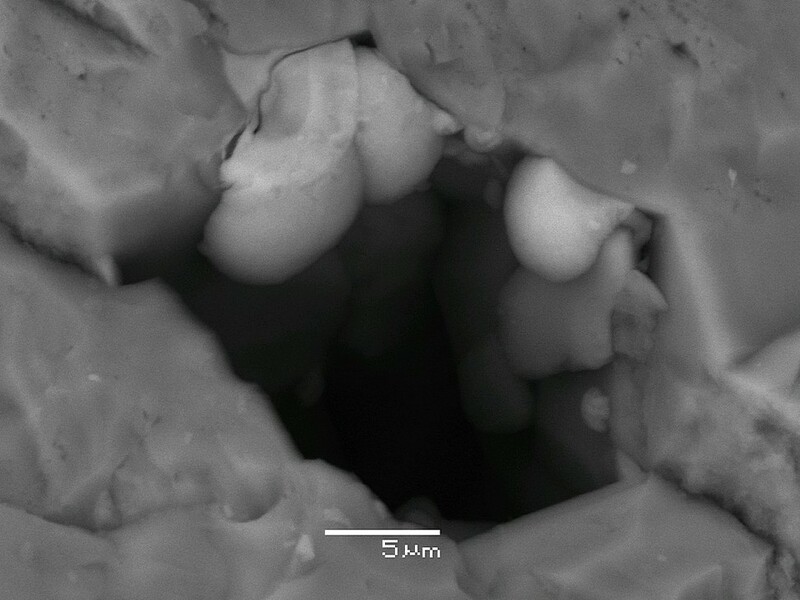 & Pantó, G. (1985): X-ray powder data and unit cell of natural hydroxylbastnaesite-(Nd). Neues Jahrbuch Mineral., Monatshefte 1985, 298-304. American Mineralogist (1986): 71: 1277. American Mineralogist (1988): 73: 440-441. Xingfu Shang, Wencong Lu, Baohua Yue, Liangmiao Zhang, Jipeng Ni, Yong lv, and Yongli Feng (2009): Synthesis of three-dimensional hierarchical dendrites of NdOHCO3 via a facile hydrothermal method. Crystal Growth & Design 9, 1415-1420. Kiyonori Michiba, Takeshi Tahara, Izumi Nakai, Ritsuro Miyawaki and Satoshi Matsubara (2011): Crystal structure of hexagonal RE(CO3)OH. Zeitschrift für Kristallographie 226, 518-530. Pantó, G. and Maksimović, Z. (2001) Two new rare earth minerals in an unusual mineralization of the Nissi bauxite deposit, Greece. Acta Geologica Hungarica: 44(1): 81-93.; Jambor, J.L. and Roberts, A.C. (2002) New mineral names. American Mineralogist: 87: 765-768.
ⓘ Szklarska Poręba-Huta quarry ? Ondrejka M., Uher P., Pršek J., Ozdín D., Putiš M., 2005: Arsenian monazite-Ce and REE arsenates and carbonates: Composition and substitution in the REEPO4 – REEAsO4 system. Example from Tisovec – Rejkovo thyolite (Western Carpathians, Slovakia). Geophysical Research Abstracts, Vol.7, 04857.